OK, let’s get this straight from the start. It’s Stone Foundation; not The Stone Foundation. It’s an important distinction because the name has layers of meaning. It’s a reference to the solid bond uniting the core of the band: Neil Jones, Neil Sheasby, Phil Ford and Ian Arnold. But it’s also a reference to the foundations that underpin the band, the songwriting partnership of Neil Jones and Neil Sheasby and the locked-in, rock-solid rhythm section of Neil Sheasby and Phil Ford. That’s not to understate the importance of Ian Arnold’s keyboards or Rob Newton’s congas, but none of it can happen without the purring V8 (I know, mixed metaphors) engine. And the rhythm section (along with the rest of the band) can turn on a sixpence as well. “Love Rediscovered” has the band alternating tempos and time signatures in a jazz-inflected piece with gentle ensemble horns and some lovely background sax fills. In many ways it’s the least typical song on the album, but it has a strand of the common thread of social commentary running through it. In that respect it’s a lot like the Marvin Gaye and Curtis Mayfield social consciousness albums of the early seventies. The big ticket news item is always going to be the involvement of Paul Weller as producer, co-writer, player and singer. On the two previous albums, the band have attracted some high-profile guests, but nothing quite in this league. The most obvious influence is in the current single “The Limit of a Man”, which has hints of Style Council, although there are suggestions of Brenton Wood’s “Gimme Little Sign” and Curtis Mayfield’s “Move On Up” in there as well. It’s a gloriously upful song and should, by rights, be all over the radio. Paul Weller aside, there are guest appearances from Bettye Lavette on the midtempo “Season of Change”, full of horn stabs and parping baritone sax, and William Bell on “Strange People” with, strings, Hammond, horns, a flute solo and even a bit of cowbell. Both singers still sound fabulous. On the ‘business as usual’ front, Neil Jones’ vocals seem to get better with each album and Neil Sheasby has created some lovely melodic basslines. Stone Foundation managed something wonderful with “Street Rituals”. They’ve expanded their musical palette by adding flute, more strings and some over-driven guitar to the usual mix of piano, Hammond and horns to create a timeless vibe that’s thoroughly modern while acknowledging its roots. There’s a lot going on with “Street Rituals”; it sounds gorgeous on the first listen, but on repeat keeps revealing more and more. Is there a better British soul band at the moment? I very much doubt it. “Street Rituals” is released on Friday March 31 on 100 Per Cent Records. 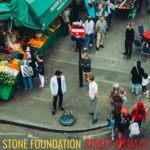 When Stone Foundation returned to Under the Bridge as headliners, the day before Chelsea entertained the new champions Leicester City, it was impossible to ignore the football parallels. Stone Foundation might not have won the Premier League yet, but they’re a group of Midlands musicians who work hard at what they do and play as a very tightly-knit team: and they’ll be playing in Europe later this year. The evening’s host and DJ, Robert Elms, had to admit to a bit of embarrassment, as a QPR fan at Stamford Bridge playing the Chelsea theme tune “Liquidator”. But this was a night for putting aside local rivalries to celebrate Stone Foundation’s return to The Bridge. Following Robert Elms’ first set, the Max Milner Community played a fine support set of soulful rock. The band knocked out some very funky and dirty grooves as Max powered through some originals and even “The Letter” as a Joe Cocker tribute. Great harmonies as well and definitely one to keep an eye on. Time for Robert Elms again for a short set before the main event. A quick check of the stage setup showed that the horn section had expanded again; four horn mics onstage and something you don’t see very often – two flugelhorns. Anyone would think it was a jazz gig. Stone Foundation; the name’s important. The band’s built on the foundation of writers Neil Jones and Neil Sheasby, and original members drummer Phil Ford and keyboard player Ian Arnold. The horn section has seen a few changes over the last couple of years, but the lineup of Gary Rollins (tenor sax), Gareth John (trumpet and flugelhorn) and Adam Stevens (baritone sax) seems fairly well established, along with conga player Rob Newton, spicing up the percussion mix. They’re in the process of recording the new album and trying out some of the new songs in a live setting. The band have built up a fanatical following in London on the back of high-profile support gigs and their own headline slots, and the response as they made their appearance made this feel like a home game for them (despite Neil Jones waving a Manchester United towel to the crowd). The set kicked off with “Bring Back the Happiness” from “To Find the Spirit” and the single “Beverley”; two songs in and the band were 2-0 up and playing a blinder. The pacing of the set was spot on, building up the atmosphere with songs from the last two albums (including “To Find the Spirit” and “Night Teller”) before introducing three new songs (“The Limit of a Man”, “Frame by Frame” and “Back in the Game”) which were all well received by the knowledgeable crowd. And then it was back to the crowd pleasers with the Studio 54-esque “A Love Uprising” (whistles and all) and the old favourite, “Tracing Paper” before ending the set on “Something in the Light” and “That’s the Way I Want to Live My Life”, complete with the obligatory mass singalong. As for the encore, well, it turned out to be a jazz gig after all. The first piece, “Old Partners, New Dances”, was a four-in-the-morning, empty jazz club instrumental played by Gareth John on flugelhorn accompanied by Ian Arnold. The pacing of the encore was perfect as well; the second song, the new “Street Rituals” was played without horns before the full band joined in for a rousing “Speak Your Piece” deep into injury time. Even Roman Abramovich enjoyed it from the VIP area behind the sound desk. The unfancied Midlanders came to The Bridge and got a result; even Leicester City couldn’t top that. Stone Foundation are the real deal. They’ve built up a fanatical fanbase (the kind that chants the keyboard player’s name during the encore and actually welcomes new material) by working very hard at their particular soul vision and they’ve done it all on their own terms. It’s still a work in progress; Neil Jones and Neil Sheasby are constantly looking for ways to tweak and improve on what they do (like adding a second trumpet, possibly only for this gig) and each year seems to bring fresh triumphs and fresh challenges. There’s a new album next year and we may even get a few surprises along the way as well. Whatever happens, it’s going to be an interesting ride. Who knows what next season will bring. You can see the pix from the gig here, and apologies to Neil Sheasby for picking up his Foxes idea and running with it.